Two weeks ago, indigenous and land rights defender Carlos Maaz Coc attended a peaceful demonstration in El Estor, Guatemala. Together with other fishermen and farmers, he was protesting against the contamination caused by nickel mining projects in his region. It was a peaceful demonstration, but Guatemalan authorities sent the riot police unit to repress it. The disproportionate use of force, including the use of rubber bullets, live ammunition, gas bombs and sound bombs, caused many people to be severely injured. Carlos was shot dead. The bullets hit his chest, and he died on the spot. Carlos and other human rights defenders from the Mayan Q’eqchi communities who live along the shores of Lake Izabal have risked — and often lost — their lives peacefully demanding clean air, water, and land. Defending the environment in Guatemala is a dangerous task: those who have spoken up have been threatened, attacked, jailed, and murdered. Killings are often preceded by intimidation, threats, smear campaigns and judicial harassment. 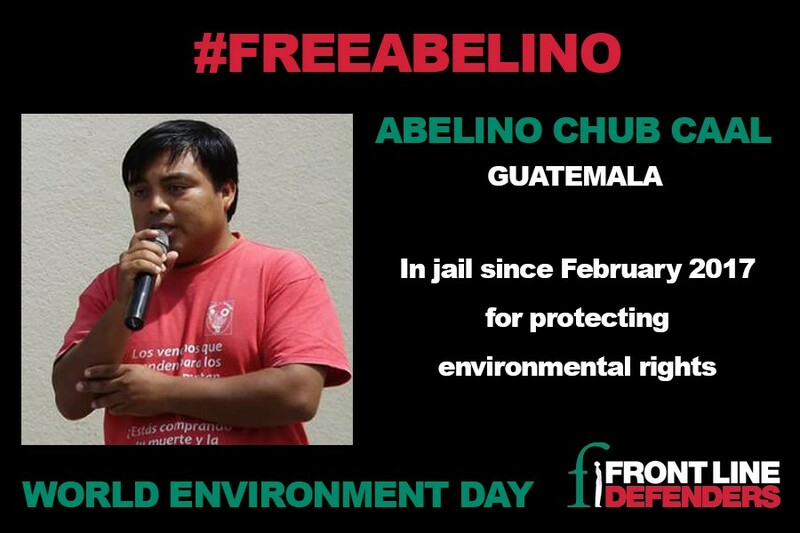 Human rights defender Abelino Chub Caal, who accompanies communities living near Lake Izabal, has been detained since 4 February, on false charges including aggravated land grabbing, arson, coercion, illicit association and belonging to illicit armed groups. He is is currently detained in Guatemala City, more than 200 km from his home and family. For the past year, Abelino has also been targeted by a smear campaign falsely portraying him as a criminal and drug trafficker in local media outlets. Abelino is a member of the Guillermo Toriello Foundation, which promotes local development and advocates for housing rights, environmentally sustainable agriculture and the preservation of the memory of the armed conflict in Guatemala. As part of his human rights work, Abelino Chub Caal has frequently acted as a mediator for communities fighting for their land rights, local authorities and private actors. While human rights defenders are treated like criminals, perpetrators of human rights abuses are not held accountable. Human rights defender Angélica Choc has spent the past 7 years struggling for justice. In 2009, Mynor Padilla — a former military officer, who was working as a private security guard at the nickel mine in El Estor — killed her husband Adolfo Ich Chamán. Despite all the evidence against Padilla, on 6 April a Guatemalan court acquitted Padilla. Angélica, who has courageously spoken out against corruption, injustice and human rights violations, keeps being threatened and harassed. Human rights violations related to mining in El Estor date back to 2006, when the Guatemalan government issued licenses to the Compañía Guatemalteca de Níquel — CGN, at that time owned by the Canadian company HudBay Minerals Inc. The government failed to seek the previous, informed and free consent of the local indigenous communities. Moreover, mining activities — as well as big agribusiness such as palm oil plantations — have caused its contamination by toxic metals (nickel, chromium and cadmium.) This is endangering the life of local indigenous communities, who fish in the lake and rely on it as their main source of fresh water. Security officers hired by the mining company have been responsible for brutal attacks and violence against the local population. In late 2006, Mayan Q’eqchi’ communities began reclaiming their ancestral territories, from which they were violently evicted during the civil war (1960–1996). The mining company requested local police to evict the indigenous communities. Together with police and military officers, the mining security personnel raped 11 women in the community, burnt hundreds of houses, and attacked villagers. Three years later, a group of security guards working for the mining company attacked the community again. In September 2009, the local population tried to resist an illegal occupation and protest. The guards reacted, shooting live bullets at unarmed civilians. One of the demonstrators, German Chub, was left paralyzed and lost the use of a lung. Then Mynor Padilla and other guards detained human rights defender Adolfo Ich Chamán and brutally murdered him. Despite the violence and the abuses they have suffered, human rights defenders in El Estor have not lost hope. In the courts and in the streets, they keep opposing powerful companies and they keep peacefully struggling to defend the rights to a clean environment. On World Environment Day, Front Line Defenders honours the struggle of environmental defenders in Guatemala and in other parts of the world, who risk their life for protecting the water, the land, and the air that belong to their communities. 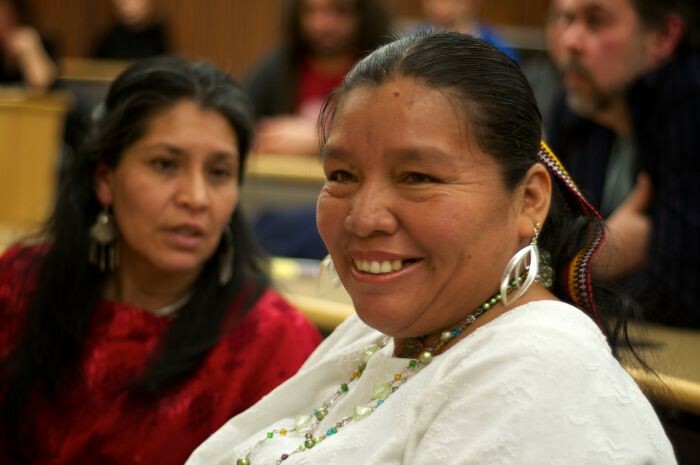 Show your support to Guatemalan HRDs and share their stories.